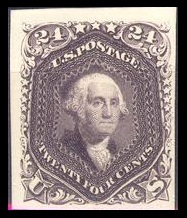 The US classic stamps formerly listed in the Scott Catalog as #55 - #62, were long referred to as the "Premiere Gravure" Issues, or the First Printings of the 1861 Issue. They are now considered essays and not regularly issued postage stamps. Some of them are now listed in the Essays section and others are listed in the Trial Color Proofs section of the Scott US Specialized Catalog. The perforated 12 examples on stamp paper are all very rare and are seldom obtainable. The imperforate proofs of the Premiere Gravure issues on India paper are only a very tiny fraction of the cost of the perforated examples on stamp paper. Plate proofs on India of the 3 Cent, 5 Cent, and 12 Cent denominations are shown in the image above. Die essays of US Classic stamps are very elusive. This one is a National Banknote Co. proposed 3 Cent design on India paper, die sunk on card (Sc. #65E14). The proposed stamp design is in deep red, and it includes the die number and inscription. 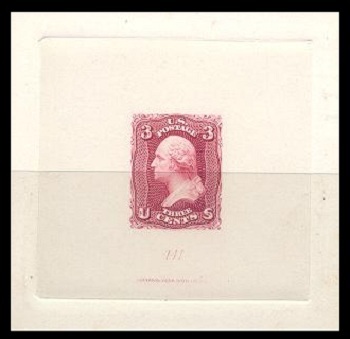 Die essay, in three trial colors, submitted by Toppan, Carpenter, & Co. for the 3 Cent postage stamp issue of 1861. 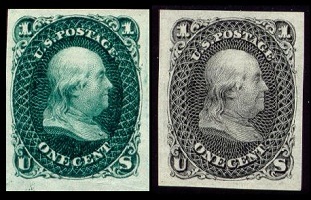 Later essays of this type show the denomination numeral "3" where the circular outlines are on these. Collecting proofs of US classic stamps can be a great sideline to one's regular stamp collection. The proofs were usually taken, right after the dies and / or plates were created, and the colors and detail are outstanding. Shown above is a large die proof of the 1861 90 Cent denomination (Sc. #72P1) on India paper mounted on card. This is what the DIE looked like, before it was used to place the impressions on the plate that was used for printing the postage stamps. Every serious philatelist, studying a particular issue, should have at least one of these. It is an outstanding collateral item for an exhibit, and, in the case of the 1861 90 Cent Issue, the die proof actually costs a lot less than a mint postage stamp printed from the finished plate. When the approved plates were first laid down, it was common practice in the 19th Century to make proof sheets from the new plates for evaluation. The proofs were usually printed both on India paper and on thick card, for the best results. Shown above are six card proofs of the 1861 issue. They are outstanding examples from the new plates, and the card proofs, even by today's standards, are very inexpensive. The India proofs are only about twice the price of card proofs, in the Scott Catalog. 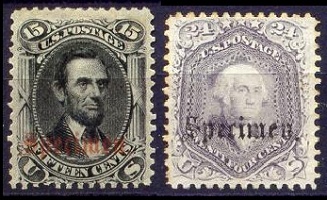 Shown above are four card proofs of the US classic stamps of the 1862-1866 Issue. When new plates were laid down and ready for printing postage stamps, it was often a common practice to make trial color proof impressions for evaluation and final approval. 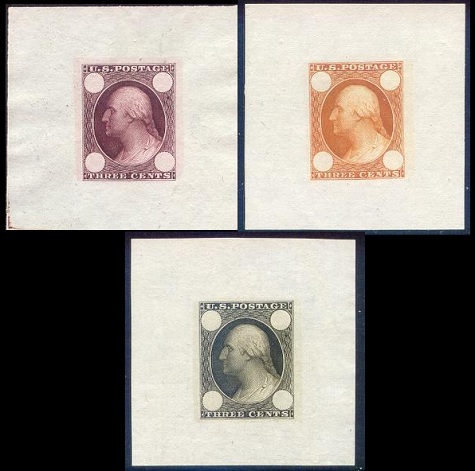 Shown above are five trial color proofs on India from the new plate for the 1 Cent Benjamin Franklin stamp of 1861. Following the evaluation and approval process, the actual issued stamp (Sc. #63) was printed in light blue. 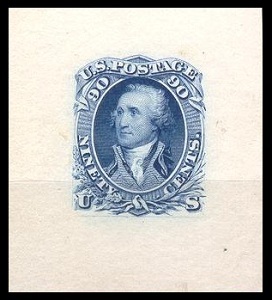 In the 19th Century, the United States Post Office took sheets of newly printed postage stamps, and then overprinted the stamps with "Specimen". These sheets were distributed to government officials and foreign postal services, so they could have examples of what our contemporary postage stamps looked like. Shown above are five Specimens of the 1861-1866 postage stamp issues. Collecting Essays, die and plate proofs, trial color proofs, and specimens, along with the regular postage stamp issues, can make for a World class stamp display. And, for a 19th Century philatelist, most of these item are really not unreasonably expensive.